Patriot Prayer members debate with CWU students outside of Black Hall. 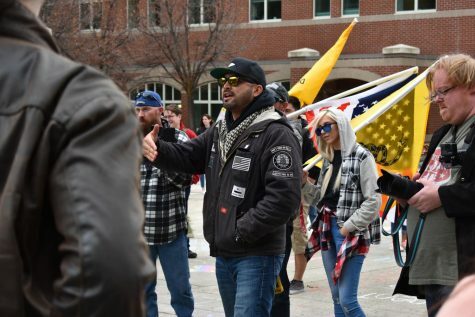 Joey Gibson, founder of Patriot Prayer, can be seen in the black jacket and red sunglasses. 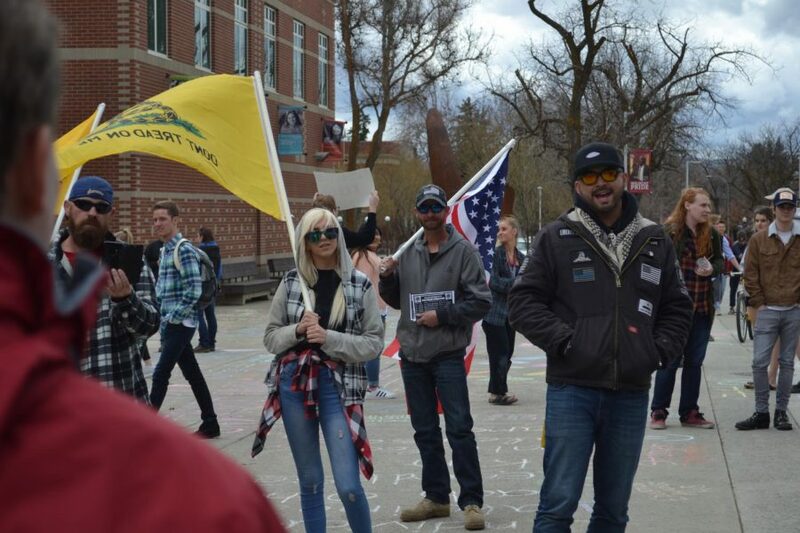 In the events of the Patriot Prayer coming to town this past weekend, I heard many people say that they did not want them here and they did not want to hear what they had to say. Neither did I. Patriot Prayer is a group that is pro-First and Second Amendment and anti-government. Although Patriot Prayer is not labeled a hate group, it did bring up a discussion amongst my classmates: should hate speech be protected by the First Amendment? We hear hateful words spread around social media, everyday life and on the news. As disturbing as it is to hear people saying hateful words about fellow American citizens, we all wonder if it should be allowed. Yes, even though I do not condone hate speech, it should be protected. The main freedom people associate with the First Amendment is the freedom of speech. This gives us the right to speak our mind freely and believe what we want to believe even if it is different from what our government or others believe. As there are some limitations and boundaries to this amendment, such as threats, most speech is justified under this law. Including hate speech. It seems like it would be a good idea at first to make hate speech non-applicable to the First Amendment, but it isn’t. Doing this would cause hate speech to be against the law which would completely go against the First Amendment and make the rules of it trickier than necessary. This would also completely contradict what this country stands for. Imagine our country where hate speech was banned. Who would get to decide what was hate speech or not? We all have a personal definition of what is offensive. What if the current president were in charge of what was considered hateful words? No one would be able to even speak their mind about what they thought of him most likely. His supporters might also label it majorly offensive to them. The point is, if the country bans one form of speech because it is deemed offensive to one group, it could cause a domino effect of banned expression. Yes, some ideas are much more offensive than others, but the solution is not to ban those ideas. The solution is to keep speaking our mind, listen to one another reasonably and try to have respect for others despite their opinions. Patriot Prayer is known for being a violent group, but this is mainly because of the presences of counter-protesters. Thankfully, this weekend, no one was hurt. If anything, Patriot Prayer remained mostly respectful and peaceful at their events from what I saw. I did not agree with what they were saying, but they expressed their point of view amicably which is respectable. Free speech is a vital part of our society. Without it, many things would not have progressed in our country. As troubling as hate speech is, especially these days, the best thing we can do is to debate it. 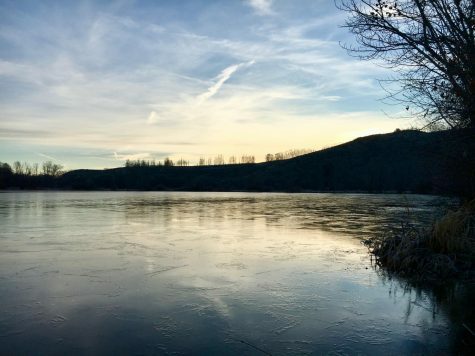 This could help everyone experience different opinions and viewpoints rather than get stuck in a cycle of their own thoughts. This seems to be happening a lot these days, unfortunately, but as long as speech is expressed peacefully and respectfully, maybe we can start listening to each other.